My last post was in September and then October came and passed us by and now it is the almost the end of November. I was missing my blog, but all summer and into early fall I must admit I was feeling quite uninspired to cook, bake or even spend more than five minutes in the kitchen. In addition, our schedule has been hectic with the addition of afternoon Kindergarten for the girls, but I think we have finally adapted to our new schedule. Now that the snow has come to stay for the winter (brrrr! ), I feel like spending more time indoors to avoid the cold and I am once again feeling inspired to try new gluten free recipes and ideas! My latest inspiration is a new bread recipe which turned out amazing! I say amazing because even I had my doubts that it might not turn out, but it turned out above my expectations. Currently I am trying to avoid milk products which is very sad as I am a girl who loves her cheese, lattes and yogurt! It is a temporary avoidance thank goodness, but it has pushed me to try one new substitution in my bread that I have not tried. What I decided to use instead of regular milk was Almond Milk which is made from ground almonds. I often use it as a substitute in my coffee but I had never tried it in baking before. It comes in Unsweetened, Vanilla and Chocolate flavours. I decided to shake up this banana bread with the addition of chocolate almond milk and it turned out very flavorful and added moisture to the bread. If you are worried about teh chocolate, this bread does not taste all that chocolately at all, it just gets a hint of the taste and the addition of nuttiness with the almond milk. This is not meant to be a sweet dessert bread, there is very little sugar or sweetness added, so feel free to use it as a everyday breakfast or lunch bread. Hope you Enjoy! 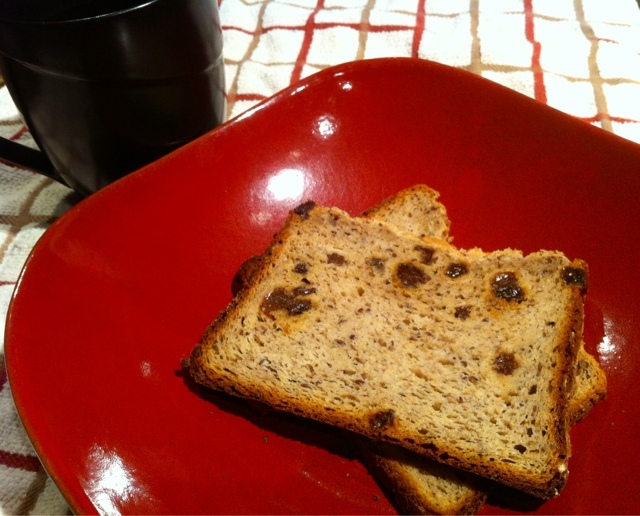 Optional: This bread has only a faint taste of chocolate from the Almond Milk, but if you like more chocolate I would add 1 tbsp cocoa powder or swap the raisins for chocolate chips. 1. Add all wet ingredients together in the bottom of the bread machine basket and mix well. 2. In a separate bowl, add all the dry ingredients together and mix well. 3. Pour the dry ingredients over top of the wet ingredients in the bread machine basket. 4. Choose your gluten free cycle on the bread machine or a similar cycle. * I always like to check my bread machine half way through mixing cycle to make sure all the ingredients are mixing properly and give it a hand by hand mixing a bit to make sure all the ingredients are incorporated. I also remove the paddle one mixing is complete as to avoid a large hole in the bottom of the loaf. 5. Once baking is complete, remove from pan and cool on a wire rack. For freezing I find it works best to slice once loaf is cooled, but if you want to enjoy a slice right away it always tastes best freshly baked.